Magic is all around us. In the Western Realm, it is the creative force that formed the world, yet decades of neglect have left the magical races in decline and to the humans in the kingdom of Floralon magic is nothing more than a fairy tale. But magic is real. You have to believe in it to find it. You have to have the gift to experience it. And to wield it, one must receive the touch from a magical creature beyond the Mountain Veil. For Feray, her entire world revolves around her family and their farm outside the small village of Greenhaven. Yet something deeper is calling to her, something powerful, something undeniable. When the Raven King comes to Greenhaven it is cause for celebration, but for Feray the King’s Festival becomes the turning point of her life, the catalyst to something much greater than the Kingdom on the Coast. She will experience evil, she will know loss, and she will meet the man with no hands. My Lady Sorceress is the first novel in a new Epic Fantasy Series by prolific author Toby Neighbors. With a strong heroine and a magical world full of excitement, My Lady Sorceress is the start of grand adventure in the tradition begun by Tolkien, Jordan, Lewis, and McCaffrey. 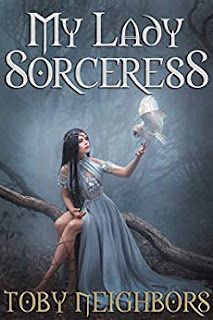 With dragons, magic, heart pounding battles, and characters so real you’ll feel like you’ve made wondrous new friends in a mythical world you’ll want to visit again and again, My Lady Sorceress is the next book obsession you won’t be able to stop talking about.